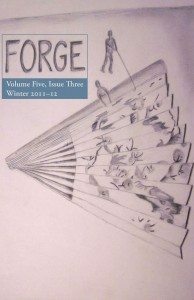 In the first Lit Mag Spotlight of 2012, we would like to introduce Forge, a magazine that is writer-tested, writer-approved! Forge is a free, writer-friendly, online literary magazine that knows where it’s going and wants to bring you along for the ride. So buckle your seat belts, and (dare we say it?) forge ahead with Forge (@ForgeJournal)! CONTEST! Leave a comment by January 26th to enter to win a copy of Forge’s Summer 2011 issue AND a free coffee mug, or tea mug, or even hot chocolate mug! (Please note that Forge will not judge you if you just use the mug as a pencil holder.) This contest is now closed. Congratulations to Harris, our winner. Thank you to all who participated! We think of each issue of Forge as a journey, and we want the contents to draw the reader along with us to wherever the road may go. Something that makes you suddenly realize that you’ve lost track of time completely. 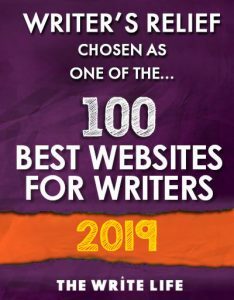 Our three submissions for the Million Writers award this year stick out to me: “The Minds of Boys” by Luke B. Goebel, “The Kindness of Strangers” by Tad Crawford, and “Not Even Jail” by Sean Jackson. “The Minds of Boys” had this Lord of the Flies meets Peter Pan vibe, with really strong imagery and a fairy-tale sensibility that made it stand out to me as one of the best submissions from last year. “The Kindness of Strangers” had this beautiful, dreamlike quality to it and a quiet sense of movement and discovery that was very well done. “Not Even Jail” comes out swinging with a strong right hook of an opening paragraph: “I’m not what anyone would call a nice person. More of what folks deem a misfit, a loser, a numb nuts. Convict. When I was a boy I had three dogs. One died under a car, one ran off and never was seen again, and we drowned the third.” That gives you such a good sense of the character of the narrator right from the start. 4. What’s the most common oversight (in terms of submission guidelines)? 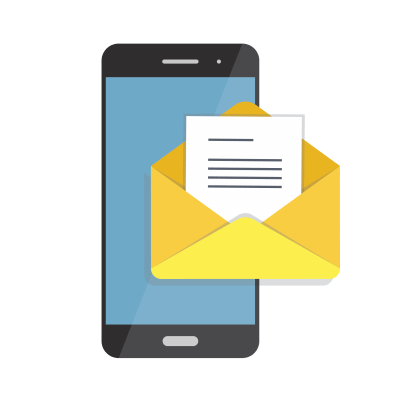 Pasting submissions into the body of an email. This makes a lot more work for us. This method is only preferable when submitting a Word or rich text document cannot work. 5. Why is your journal awesome? For starters, we work hard to include awesome cover art and illuminated letters for our issues. After five years and counting of publishing, we still look forward to the new worlds that will be discovered in each installment. We consistently crack the outer shell of awesomeness to get at the gooey center. It’s messy, but delicious. Our website has our submission guidelines. 7. What do you want future readers/contributors to know about Forge? Our original vision of Forge was that it would be a journal open to considering any kind of writing, any genre or format of artistic expression. We wanted something that would be at once familiar and strange, comforting and challenging. Polished and brash. I feel like we’ve mostly succeeded in that goal. There are times when it feels like having such a vague modus operandi perhaps makes us less appealing. The ability to define ourselves as only science fiction, or literary fiction, or poetry would be an easier road, since you can focus on one aspect and really say “this is us.” But in the end, we have grown fond of the messy sort of landscape where a religious homily on loneliness can rub shoulders with a mad-cap story about vampiric cows. That’s who we are. Leave a comment by January 26th to enter the contest to win a copy of Forge’s Summer 2011 issue AND a free, all-purpose Forge mug! Click LIKE and TWEET below to share this with your bookworm friends! This contest is now closed. Wow, thanks for all these amazing comments! It’s so encouraging to hear that the concepts we’ve built Forge around have traction; I hope we’ll see your work in the journal some day. This really made my day. Most brilliant introduction to a lit mag ever! Made me want more. “Polished and brash.” If someone uses those words to describe me one day, I will consider myself “arrived”. I enjoy reading a variety of different genres, especially stories I could never write. It’s like picking up a rug and wondering how the assortment of dust bunnies snuck under there. Sounds like a winner to me. Particularly this: “Something that makes you suddenly realize that you’ve lost track of time completely.” Great pitch. Forge ahead, kind sir (“forge” just *sounds* masculine, doesn’t it? ), bearing gifts of free Lit and coffee/pencil/loose change holders. Love this find. I especially like the name “Forge” for a lit mag. I want to get at the gooey center. You WILL get submissions from me. Of course I don’t know any vampiric cows personally, but fiction opens up all kinds of possibilities–as do messy landscapes. Want to Forge a friendship? Forge is a good endeavour; i especially liked the short story ‘Fortunately’. it was a delight to the palate, with a tinge of dramatics thrown in to keep the reader glued to the narrative. If Forge can bring such a beautifully subtle story to my attention, the magazine deserves a berth in my Book train. That is an amazing interview. This is one magazine I am going to investigate. Too many times the stories in a publication all have the same “feel” as though the writers and editors all attended the same writing class. Thanks for publishing and for the opportunity. One can never have too many coffee mugs. I’ve been a fan of Forge magazine since it’s beginning. What I love about Forge is that in one issue I’ll read a piece that I will finish with a contented sigh, another might knock me a bit off balance and set me to pondering, and then there will always be one that I’ll despise and possibly not finish in protest. I love the chance to be exposed to and challenged by that much diversity in one issue! So glad to be introduced to Forge magazine with a myriad of writings to lose myself in while enjoying a mug of my favorite drink. That’s one of the sexiest Q&As of a lit journal ever written. I am so happy to see all kinds of writing excepted, it seems that now a days it is so hard to get noticed unless you are a Hollywood big shot, like an actor, you don’t stand a chance.Consider me in your contest. An eclectic journal is welcome on my doorstep. I hope that I’ll be able to enjoy numerous editions of Forge, and that one of those numerous will contain a story that I’ve written. I look forward to hearing more about the magazine. This journal sounds wonderful. A journal that has an eclectic venue is really appealing to me. I enjoy so many different types of writing that having a magazine like this is just what I like. I have already bookmarked it so I can return and peruse it more throughly. I am glad that you brought this to our attention. I also look forward to submitting a piece to them. I feel as if they created this magazine just for me. Their random hodge-podge of accepted work is exactly the way I write! Thanks for the info on Forge & good luck to all the entrants. Off to check their submission guidelines now. Thanks for embracing so many different types of writing in one mag. I personally prefer that. Keeps things lively. But I see how that could be a difficulty when it comes to marketing. I’ll look into submitting! And count me in the contest, please! I love Forge! Never having read the magazine, I’m so glad I found this interview, because Forge definitely sounds like something I’d want to read. I admire that they want a hodge-podge of talent rather than restricting their taste to one type of writing. I can’t wait to crack open the shell of awesomeness that is Forge.